A remarkable family from Thorpe Satchville have raised almost £50,000 from a series of gruelling fundraisers, and they are already planning more in 2019. Matt and Nicki Lygo and their children, Maddy (16), Gabe (12) and eight-year-old Nate have all taken part in long distance walks and bike rides over the last four years. All the proceeds go to Duchenne UK in the name of their young friend Tom, who has Duchenne muscular dystrophy, a muscle-wasting disease which confines sufferers to wheelchairs and gives them a short life expectancy. The money has been boosted by the family’s annual Melton swimming event, the Duchenne Dip, and Matt’s 17 marathons. Nicki is preparing to run 190 miles along the hilly Peak Boundary Circuit in 100 hours in May with ranger friend Stu Westfield. She said: “We will be on our feet for a large proportion of each day, grabbing just a short sleep each night if we can. Their progress can be followed on the family’s fundraising Facebook page, ‘Miles for muscles: fundraising for Duchenne UK’, where there will be regular updates. 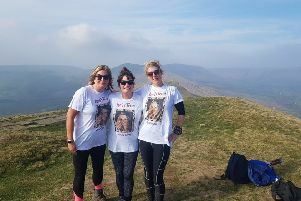 Nicki, a junior doctor at Leicester Royal Infirmary, and daughter Maddy recently walked hundreds of miles along the Pennine Way, raising £7,500 for the charity. Maddy walked the 268 miles across challenging terrain from Edale in Derbyshire up to Kirk Yetholm in Scotland with her mum acting as ‘pack horse’ and chaperone. Maddy then went home and Nicki trekked all the way back after a night’s rest, completing a fell marathon a day for 10 consecutive days and covering a mammoth 536 miles in total. She said: “That was easily the hardest thing I have ever done. “At times the pain in my feet was intense, particularly at night, which made sleeping difficult. Maddy said: “It was incredibly hard, particularly setting out and knowing I had 268 miles to cover and so many hills to climb. The Lygo family plan to continue fundraising as there is a strong hope that current gene therapy trials may bring about a long awaited cure, and save the lives of thousands of children who currently suffer with the debilitating disease.